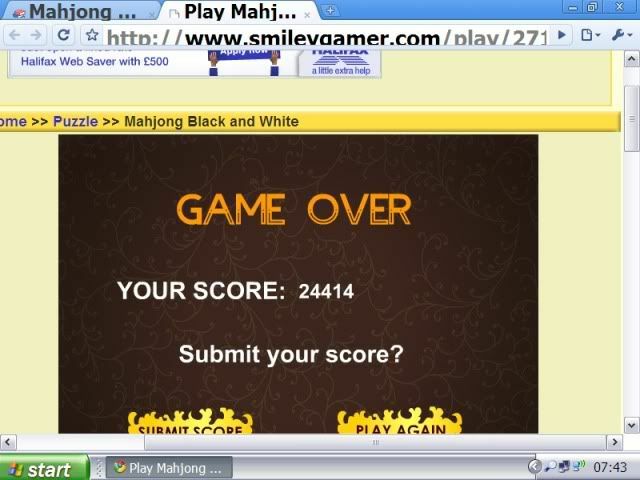 Pips if you scroll down from majong you will see other mahjong games that are a lot clearer to see I have played them quite a few times. I am practising on this one at times. changing the background colour helps. Now Stan is chasing you, I have 2 to chase. Well its taken a long time but got a new score of 51196 come on Stan where are you. I keep running out of time, on level 2 ...... lol. I'm having more luck in Atomica. Pips I cant get that game on here puter does not like it. Ahhhhhhhh, I have to swear at it. Oh what a shame Bell. Atomica and Super Text, are my favourites. I would like the words, you use, Bell, please. Gonna have to ask Mr Pips, for some then.. ( Gordon Ramsey and Billy Connelly, have nothing on him ). Dont think they will Stan everyone loves your shed lol. Just that I spend to much time playing the game Stan. Find me a Scottie dog if you can Pips very ahrd to find. Something like this for a siggie ?